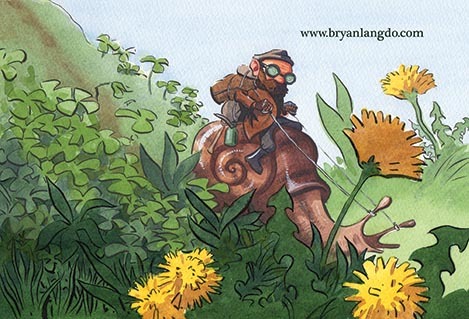 Sub It Club welcomes author/illustrator Bryan Langdo to The Postcard Post. 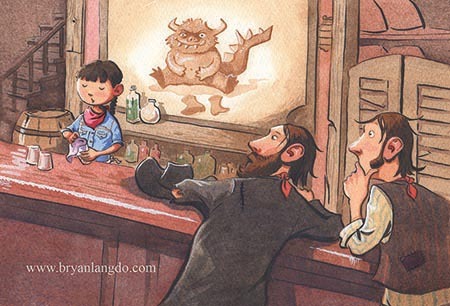 Bryan Langdo is the illustrator of over 30 books for children and the author of two. His picture book TORNADO SLIM AND THE MAGIC COWBOY HAT (Two Lions, 2012) won a 2013 Spur Award for Storytelling from Western Writers of America. Bryan started drawing when he was two and eventually took art lessons from children’s author/illustrator Robert J. Blake. After that, he studied life drawing and oil painting at the Art Students League of New York and then went to Rutgers College to earn a BA in English. Since then, he’s worked with many publishers, including Henry Holt & Co., HarperCollins, Scholastic, Harcourt, Sterling, Amazon, Grosset & Dunlap, and Hooked on Phonics. He’s a monthly contributor to Cobblestone Magazine, as well as an editor for an ESL website and app. Bryan lives in Hopewell, New Jersey, with his wife and two children. I wish I had a more exciting answer for this, but really it just comes down to whether I think the illustration is good. Does it show off some of my talent in a unique way? Did I accomplish something I usually have a hard time accomplishing? Does it show an interesting character, an interesting angle, or an interesting event? 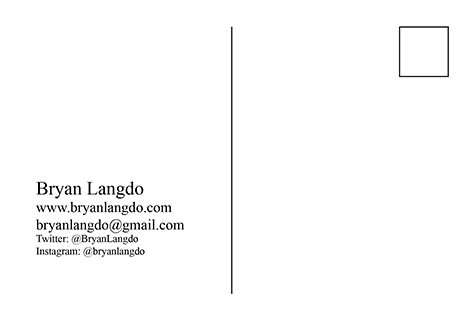 I always put my website address (which is essentially just my name) on the front of my postcards. I typically use a color picked up from somewhere in the art, so that the text complements the art and doesn’t compete with it. The reason I insist on having that text there is because there’s always the chance that an art director or editor will post it on the wall. And if that happens, my name/website address will be visible to anyone who notices it. All of my other contact info goes on the back, of course. *If we have to multi-task, the illustrations should too! I always have it in the back of my mind to do something like that. I have created series before, for myself. But I’ve never turned them into a series of postcards. The problem is that there’s always one in the bunch that doesn’t quite meet the I’m-going-to-pay-a-ton-of-money-to-get-this-printed-and-mailed standard. 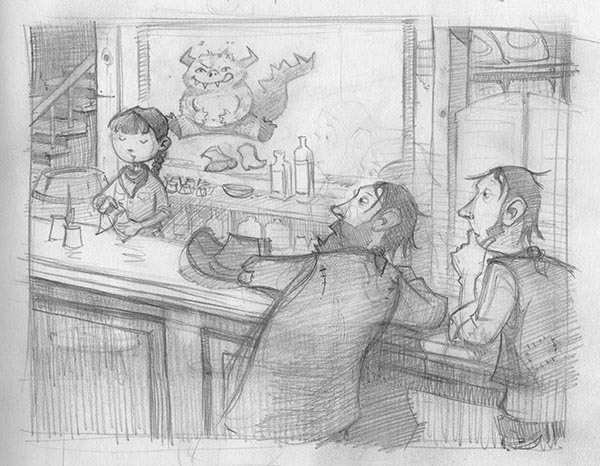 Or I wind up doing another illustration in the interim that I like better, and then I just forget about the series. For a while I was sending postcards out almost every month. That was for about a year. * I haven’t done a mailing in several months now, though. I’m planning to send one in January, and from then on, I’ll probably just stick to 2 or 3 times a year. *WOW! That’s the most in The Postcard Post’s history. You win a big prize. I have a list of about 700-800 names*—art directors, editors, and designers. I send to all the big publishing houses, many smaller, independent ones, book packagers, magazines, and educational publishers. I only target the children’s market. I have a Google doc with a list of contacts. Any time I find a new person to send postcards to, I add her or him to that list. Then I have Word documents with my mailing label templates. So if anyone moves from one house to another, I make the changes in both the Google doc and the Word file. I’m great at sleuthing! * I’ve found people on various directories, Twitter, LinkedIn, articles on Publishers Weekly. *A great sleuth who is also very organized. You have to come back to Sub It Club and share all your tricks! I use Photoshop to make sure the illustration is print-ready and to place text. I’m not a graphic designer, so my font choice is never that thoughtful. I just play around until I find one that works well with the art. I use PSPrint. Their prices are good, and they provide a handy template with crop marks and all, so you can see exactly how your finished postcard will look and make sure you won’t lose any important elements. Thanks so much, Bryan for sharing your fun postcards and tips. If you’re joining us for the first time at The Postcard Post, you can catch up with a general article on postcard mailings for illustrators and previous featured illustrators in the archive (there’s a tab above too). Great artwork and tips here! Thanks!